EL MONTE – Potrero School third-grader Clarissa Alvillar beamed with happiness after unwrapping and trying on her new gray Champion athletic shoes, which she said luckily matched her favorite color and fit comfortably. Alvillar was one of 300 students in kindergarten through third-grade at Potrero School to receive a new pair of athletic shoes during the Shoes That Fit event on Jan. 23. Shoes That Fit is a Claremont-based nonprofit that battles poverty by giving children new pairs of shoes with help from the community. Potrero School’s event was sponsored by Kaiser Permanente Baldwin Park Medical Center, which began gathering donations in November. Several nurses from the hospital attended the event and handed out shoes to the overjoyed children. Students received a variety of brands from the community, including Adidas, Nike and Converse. Providing children with new shoes is an excellent way to improve self-esteem, attendance rates and class participation, Shoes That Fit Vice President of Strategic Partnerships Nekeda Newell-Hall said. Newell-Hall said donation events are the best part of her job because she gets to see pure excitement from children. Third-grader Amy Mojica said she looks forward to wearing her shoes while playing soccer and is thankful because she knows that shoes are expensive, so this donation provides financial relief for her parents. 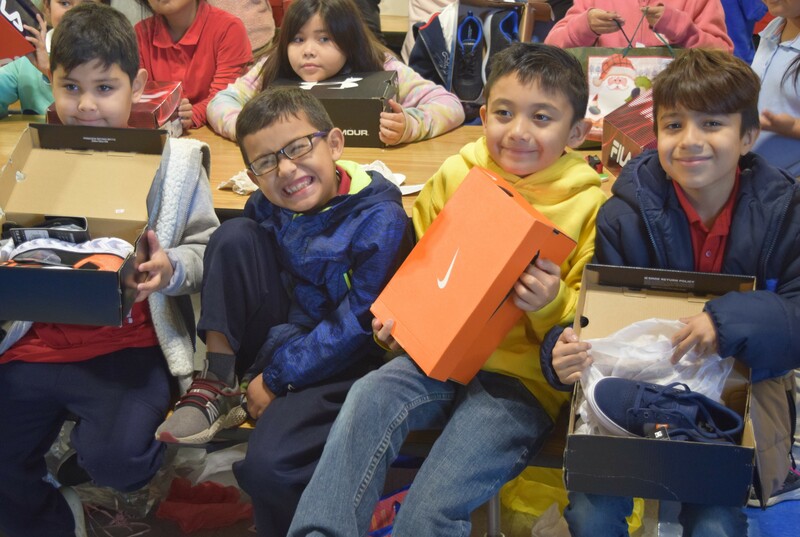 EMCSD_SHOES1: Three Potrero School students smile and scream with excitement as they hold their new pairs of Sketchers, Vans and Nikes during the Shoes That Fit donation event on Jan. 23. EMCSD_SHOES2: Several Potrero School students smile and show off their new shoes during a Shoes That Fit event on Jan. 23. The event was sponsored by Kaiser Permanente Baldwin Park Medical Center, which provided 300 pairs of shoes for the school’s K-3 students. 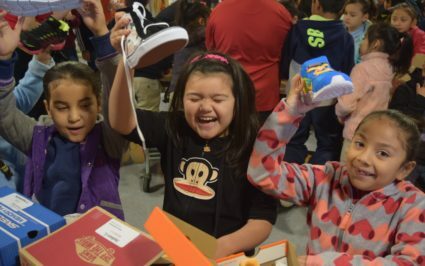 Three Potrero School students smile and scream with excitement as they hold their new pairs of Sketchers, Vans and Nikes during the Shoes That Fit donation event on Jan. 23. Several Potrero School students smile and show off their new shoes during a Shoes That Fit event on Jan. 23. The event was sponsored by Kaiser Permanente Baldwin Park Medical Center, which provided 300 pairs of shoes for the school’s K-3 students.